"[Sander's] collection of photographs, as finely delineated as they are unpretentious, is a treasure-trove for the student and lover of physiognomy and provides an excellent opportunity to explore the occupational and class-structured imprints on humanity." Although the work of August Sander (1876-1964) was largely uncelebrated in his own lifetime, and was banned by the Nazis (who destroyed many of his negatives), today Sander is regarded as one of the most important photographers of the 20th century. 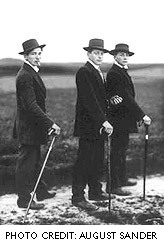 In the 1920's, in a radical departure from the artificiality of prewar studio portraiture, Sander pioneered a naturalistic documentary style, photographing citizens of Weimar Germany amidst their real-life settings, attempting to convey, in his words, "a picture of our times absolutely true to nature." Over the next decade, his efforts grew into an ambitious social-documentary project he entitled People of the 20th Century. Eventually encompassing more than 600 photographs divided into 45 portfolios, it captured people of all classes and occupations, and was hailed by novelist Alfred Doblin as a portrait of "the collective power of human society, of class, of cultural status." The first documentary about the groundbreaking photographer, AUGUST SANDER chronicles the photographer's life and work; from his childhood in a poor miner's family and his early career with the avant-garde artists' group known as the "Cologne Progressives," to his photographic trips into the countryside and his part in the "New Objectivity" movement, through wartime attempts to protect his photos and negatives from the Nazis and allied bombs, to artistic recognition late in his career, including a 1951 exhibit in Cologne and the inclusion of several of his photos in the Museum of Modern Art's "Family of Man" exhibition in 1955. Interweaving historical footage, scores of photos, and interviews with a former assistant, museum curators, his daughter, and his grandson (who today preserves the Sander archive), AUGUST SANDER is a moving reaffirmation of the historic value of photography, and a compelling demonstration of its artistic power to document our world, as Sander proclaimed, with "impressive beauty or cruel accuracy."